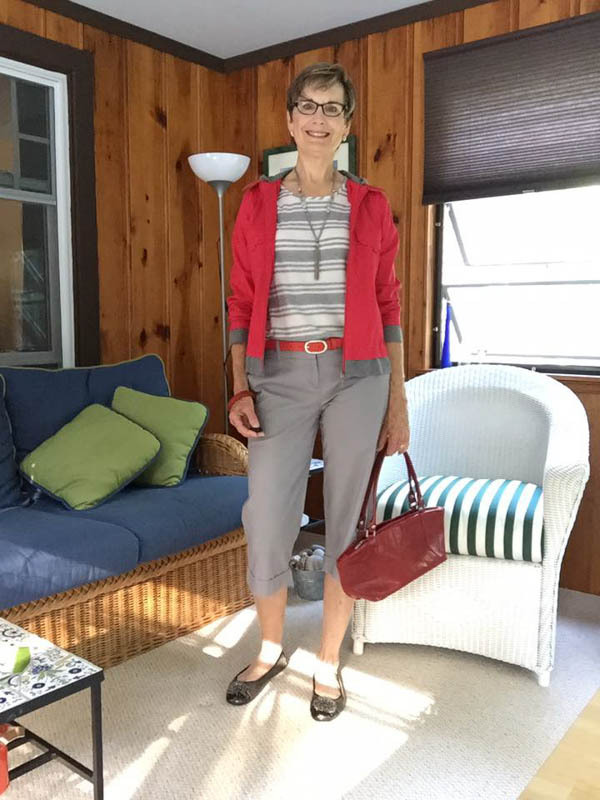 Natalie is one of the members of the 40+Style Club and resides northwest of Boston in Massachusetts. She has a penchant for classic outfits with a twist of modern and unique pieces. Let’s discover her style secrets! Can you tell us more about yourself? As a point of reference which age group do you belong to, or perhaps you are willing to share your age? 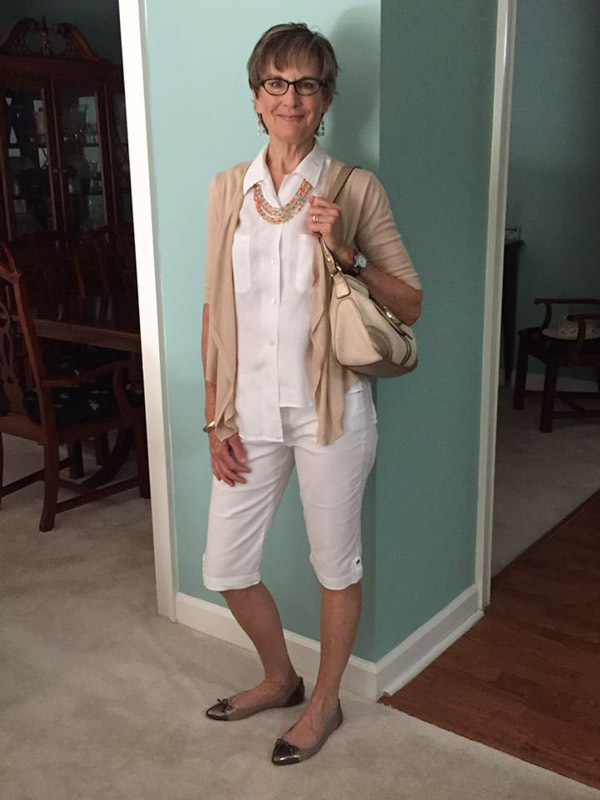 I am 63, married and have 2 twenty-something sons. Currently I work as an academic coach in a middle school. Along with style and design, I enjoy spending time with my family, creating art, thrifting, gardening, kayaking, live music and a good red wine. I consider myself a “multipotentialite”, or someone without one true calling. (Emilie Wapnick, TEDtalk 2015). I live 40 minutes northwest of Boston in Massachusetts, US. The beauty of living here is that we experience all 4 seasons which means 2 distinct wardrobes for the extremes and lots of crossover clothing. I am always cold so I live in scarves, sweaters and my black lace-up army boots from November through March. Creative Classic, Tailored with a Twist, Modern Classic are all ways I describe my style. I like the creative or twist element to be something unexpected. A statement jacket, fun shoes, mixing patterns and textures, or vintage accessories. My favorites include a floral bomber jacket, patent and “pony fur” Sam Edelman shoes, fuschia floral scarf, and vintage caramel and pale pink polka dot sweater. While I came of age following groundbreaking models Twiggy, Jean Shrimpton and the avant garde Peggy Moffett in the 60’s, the menswear styling of Katherine Hepburn and later Diane Keaton, really spoke to me. Wide leg pants, tailored shirt, vests and jackets was my go to style. 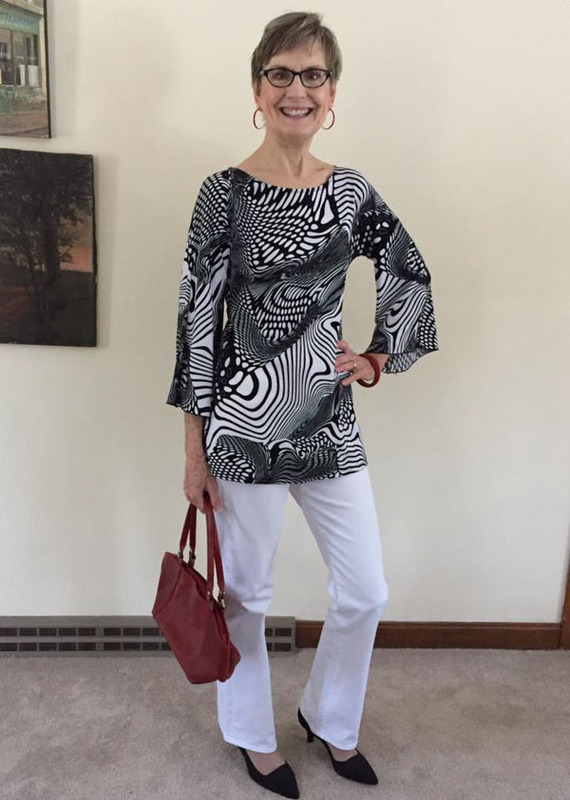 I have not always followed trends over the decades, but have trusted my instincts and have developed a basic wardrobe (which now includes skinnies, leggings, and a frilly item or two). 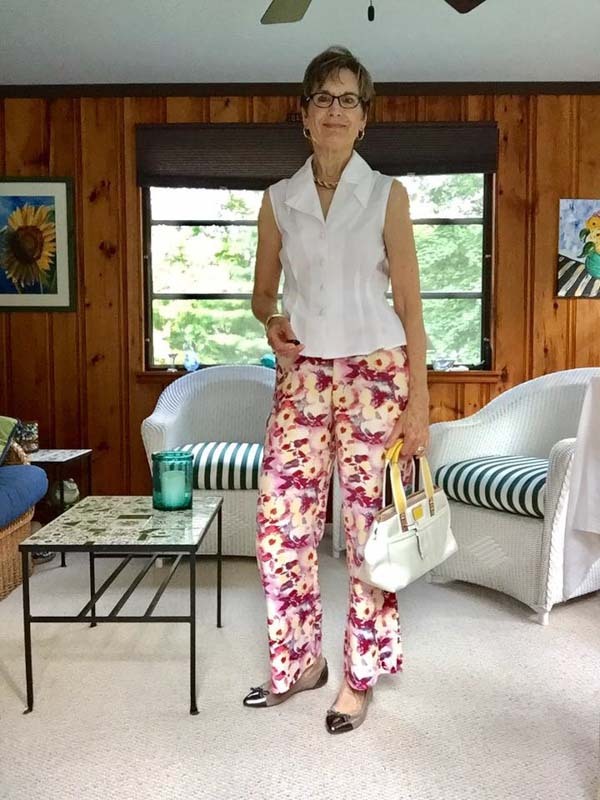 My style is evolving as I learn more through the 40+Style Club about silhouette, proportion, fit, and color while experimenting with new ways to style old favorites to get more from my wardrobe. I have always been interested in style, fashion and accessories. As a young girl, I loved playing dress up. Early on, I received a hand me down black patent leather handbag from a friend’s aunt. She was 21 and drove a Corvette. I was 8, wide eyed and hooked. Being lanky with a primarily rectangle body shape and flat chest, I was always drawn to menswear styling over the flirty, flouncy, frilly, feminine styles. In warmer months, my closet is filled with color and fun graphic prints. Winter is quite the opposite and the challenge is adding brights into my wardrobe as store racks are filled with dark colors. 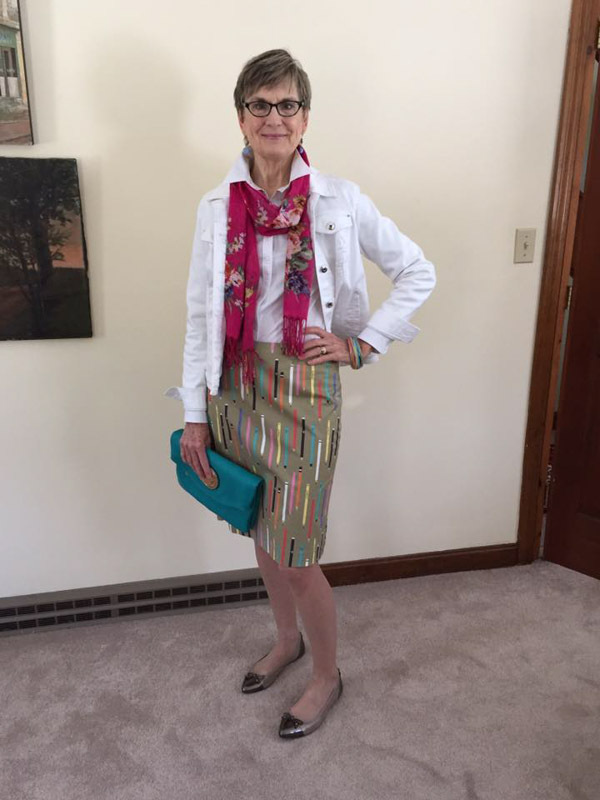 Age appropriate dressing for me means looking confident, stylish and relevant without appearing frumpy or, worse yet, desperate. This is much easier to do now than in my mother/grandmothers generation. Designers realize that 40, 50 or 60+ women need to be catered to due to our buying power. 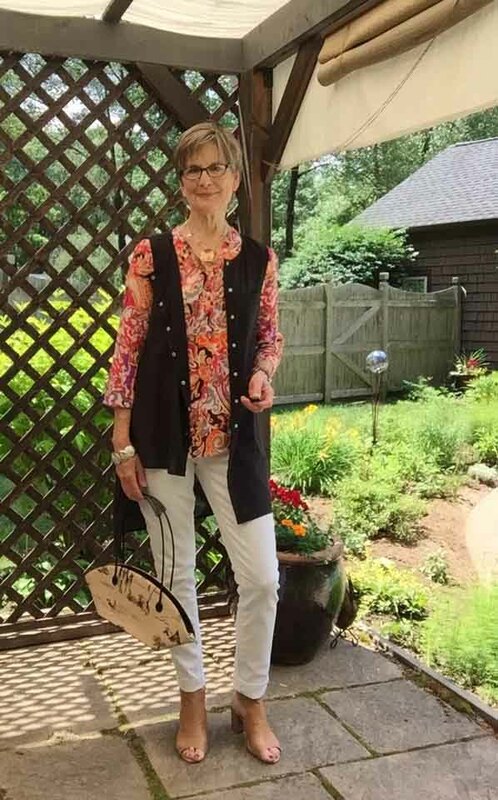 This is evident with styles that take into account the menopausal body changes (hide the belly tops, better cut jeans, etc), the use of fabrics with stretch to add comfort for active lifestyles and the introduction of oldermodels to represent brands. Well, life is short and I’m not finished playing dress up yet. To quote venerable style icon Iris Apfel, “When the fun goes out of getting dressed, you might as well be dead”. I love that! Making an effort just feels good. I am treated better and taken more seriously which is important to me as an aging woman. 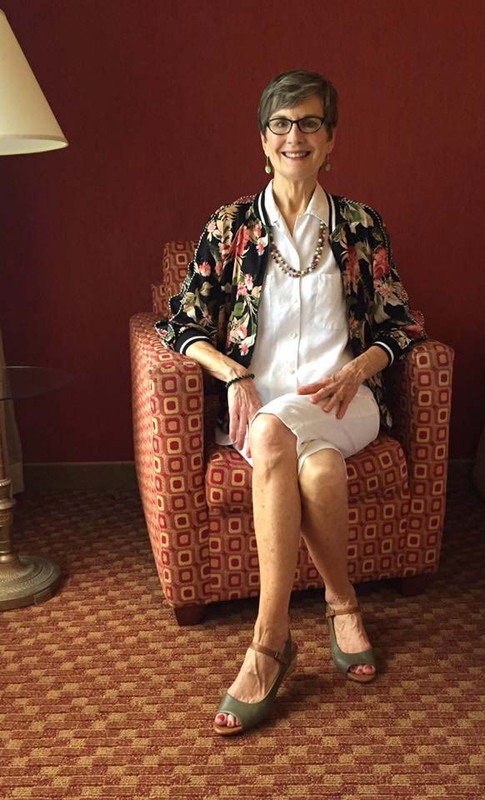 Ruth Essex, a 40+style club mentor once quoted someone who said “choose to show up in your life everyday”. Taking the time to present myself authentically through style and engage with the world around me is my way of showing up. The style club has taught me how to look at style, fashion, and trends with a more critical eye. I have stopped impulse buying and am editing my wardrobe while expanding how I use my clothes to create new stylish looks. It wasn’t easy to start posting selfies but it has become a fun and valuable tool to put what I’ve learned into action. The feedback from the 40+style team and my new international style conscious friends is always thoughtful and encouraging. We are all on this journey together. Thanks so much Natalie for participating in my style interview series. This is going to be a tough one, but which of Natalie’s outfits is your favorite? P.S. Today I released the fabulous new Fall Capsule in the 40+Style Club! Create more than 84 outfits from just 15 pieces! You will get style training on the trends, a complete shopping list (all items are currently available online), a 10 outfit challenge that will start on 16 September where you can (optionally) share your outfits with the community and a complete list of all 84 outfits that you can create from the capsule. As a bonus you will get access to all other style training in the club too! You will also get to interact with Natalie and the many other women of the club in the private member community. You can join the style club here. I love to see all your stunning and vibrant outfits one after another. You have a great gift to choose your colours and looks. Thank you Claudia. I should move to warmer climes where I can wear those brights all year round! Hi Natalie Love your style you look fabulous in all the outfits. I feel inspired to step out of my comfort zone. My closest really needs a lift. Thank you for your posts. Thank you Janet. I say go for it. I have been on a closet purge for a few months now getting rid of the orphans that I liked but never wore. It feels good to have a more workable wardrobe but there is more to do. Oh my goodness. Natalie! 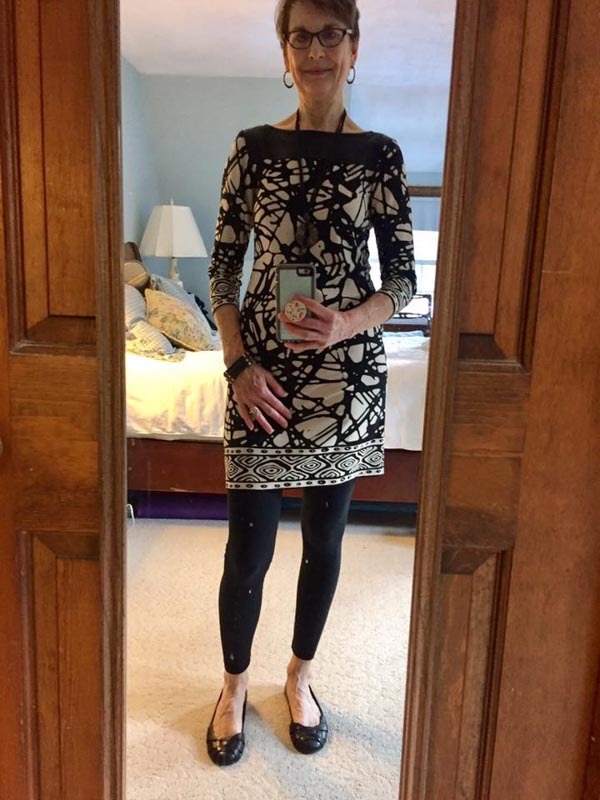 Seeing all these selfies that so reveal the amazing woman of Style you are! made me realize how appropriate your style words are. Varied but a definite theme emerges. Fabulous interview and hard to choose but you are especially striking in the dark print dress and short sweater. Well done! Thank you Elle for your kind words. I didn’t know which photos 40+ would choose so it’s fun to see their selections. I actually have 3. I can’t decide between the dress with black sweater or the multi square print, black slacks with blue purse. They are 1 & 2. # 3 is the classy beige shorts outfit. Love the glasses. Thank you Sherry. I think my favorite is the shorts outfit too. Super interview and outfits Nat! 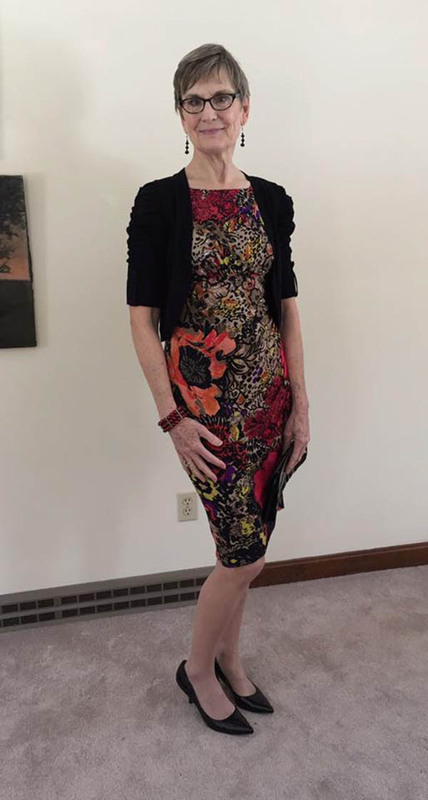 I love the flower print sheath dress with the short black bolero jacket and shoes. Sooooo……flattering. Thanks Elaine. It’s fun to see which outfits they choose to post with the article. I definitely like those graphics prints!! Fantastic interview Natalie. I love how authentic you are to your style and essence of who you are. Your hobbies and lifestyle truly align with your fashion style. Kudos!! Thank you Cynthia for your kind words and insight. Answering the questions was a thoughtful process for sure. So very nice to read these interviews! 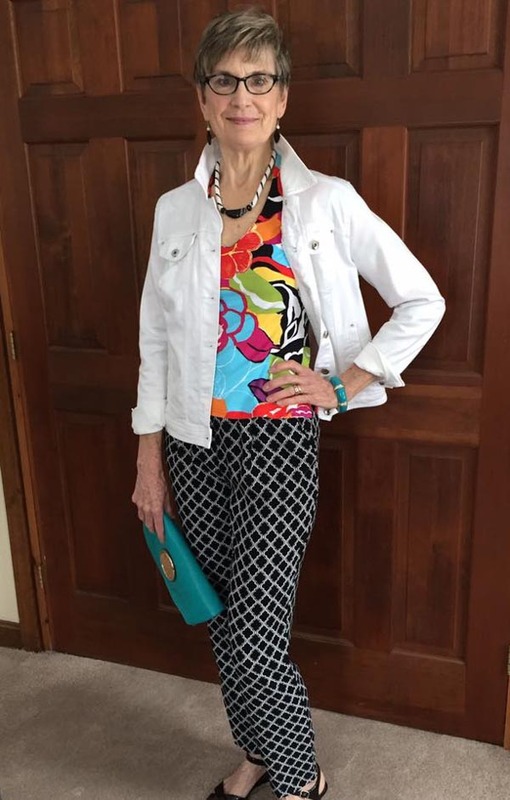 Your style is very diverse, which is fantastic to see! Thanks Nancy. The common thread seems to be the bright graphic prints which makes it more difficult for me to embrace the fun with my winter wardrobe. Still working on that. I love all of your outfits! You have a real knack for using colors and accessories. Thanks for sharing. Hi Flora. Thank you for you kind comments. I will miss all the summer bright colors as we head into the colder weather. I remember Natalie’s black and white tunic dress in the style challenge. 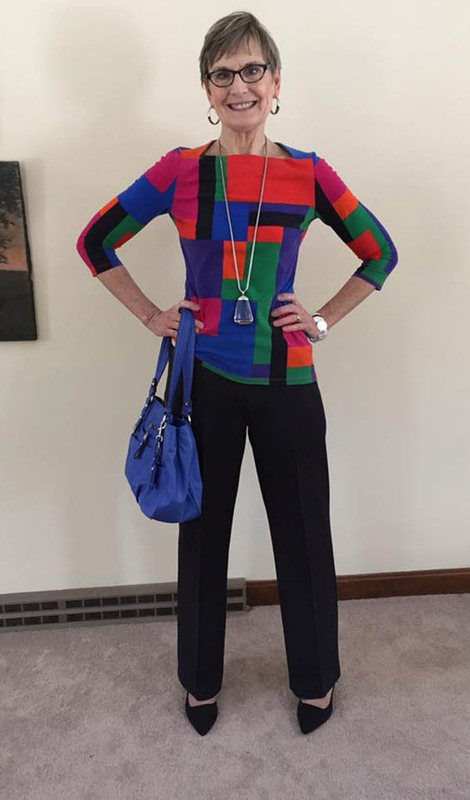 I absolutely adore her outfit with the bright multicoloured figure hugging top, the black trousers and black shoes. Perfect. So my style too. Thank you Greetje. I’ve been a follower of your blog and admire of your simple yet elegant style. Thanks Natalie, I am chuffed. I recognised a lot in what you said in your interview. Nodding while I was reading “uhuh, yes, that is what I think as well” haha. Glad to hear my comments resonated with you Greetje. Now I’m chuffed! !